Don't ask me why, but I have a thing for jars. For example, I use them a lot as pen pots and I even have a jar I use as a piggy bank, but mine is more practical. LOL I prefer to decor jars, otherwise they may look a bit boring unless they have a particular shape. Still, they always have a better look with a bit of decorations/painting on, don't you agree? 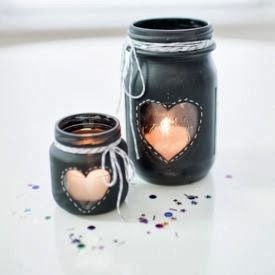 Of course, I do love candles, too. So, when I saw the lovely jars candle centerpiece on the left, it popped on my mind that "uh, this I can do!" and so I will!